Magdi Mostafa, “Sound Element,” 2013. 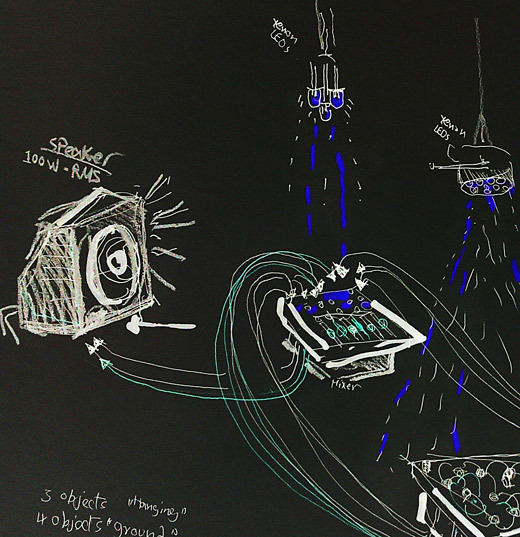 Installation drawing. Mathaf: Arab Museum of Modern Art opens a Project Space in Doha, dedicated to new tendencies in artistic production and emerging curatorial practices. Collaborations with international artists and experimentation in curating and art production are central in the activities of the Project Space. For the first installation in its Project Space, Mathaf invites Egyptian artist Magdi Mostafa to continue exploring the dialogue between sound and space. Mostafa’s work evokes personal and shared memories, recalling different images and emotions to be experimented by the visitors. The artist will continue his ongoing series of installations and performances titled Sound Element, for which he is creating a surround-sound installation that blends experimental electronic and found sonics. Sound Element evolved from a series of field recordings that the artist has been doing since 2007, putting an emphasis on different background sounds that often go unnoticed in everyday life. Rather than planning a series of installations and performances in advance, Mostafa allows the sounds of his work to develop naturally, to let them “grow like the roots of plants and trees.” Using a variety of frequencies, Sound Element is meant to trigger certain layers of ‘chemical reactions’ through the vibrations of sound within the space. The effect that this has is determined by the individual’s nature and becomes a very personal experience. Set in an entirely dark space, Sound Element invites the visitor to use hearing as their primary sense to take in the artwork. Beyond the physical experience of the artwork, one can interpret the function of sound as material that takes an important space in the development of our societies today, and the revolutions wave in the Arab world gave the sound a voice expressing the idea of change, of progress and movement in general. Born in 1982, Egyptian artist Magdi Mostafa has graduated from Helwan University in Cairo. Through experimentation with contemporary media, his work evolved into installations in which sound and light play a prominent role. Mostafa has recently exhibited his work at the Sharjah Biennial 11, and he has collaborated with the Fondazione Pistoletto in Italy, and the Biennale Jogja XII 2013 in Indonesia. Mathaf: Arab Museum of Modern Art is a QMA museum, led by H.E. Sheikha Al Mayassa bint Hamad bin Khalifa Al Thani. Initiated by H.E. Sheikh Hassan bin Mohamed bin Ali Al Thani, with around 7,000 works gathered over the past 25 years from the Arab, Asian, African and Western regions, the collection represents the major artistic trends and sites of production. Mathaf showcases major exhibitions, both historical and experimental, and large-scale education programs. Mathaf opened in 2010 in Doha’s Education City. Spanning the 1840s through the present, the museum’s permanent collection offers a rare comprehensive overview of modern and contemporary art. Under the direction of Abdellah Karroum since 2013, the museum launches a pioneering series of new projects including Mathaf Curatorial Dialogues and Mathaf Project Space encourages research and scholarship, offers programs that engage the local and international community and contributes to the cultural landscape in Qatar, with a special interest in developing transnational relations with the Gulf region and beyond.